Thank you all very much. We're very proud to be back here. It is appropriate that I come here today. It's time for me to step aside so that history can blaze its path. We do not know who will take the final steps to 1600 Pennsylvania Avenue, but what we do know is that our Democratic Party will make history. We will be strong, we will be unified, and with our convictions and a little backbone we will take back the White House in November and we'll create hope and opportunity for this country. This journey of ours began right here in New Orleans. It was a December morning in the Lower Ninth Ward when people went to work, not just me, but lots of others went to work with shovels and hammers to help restore a house that had been destroyed by the storm. We joined together in a city that had been abandoned by our government and had been forgotten, but not by us. We knew that they still mourned the dead, that they were still stunned by the destruction, and that they wondered when all those cement steps in all those vacant lots would once again lead to a door, to a home, and to a dream. We came here to the Lower Ninth Ward to rebuild. And we're going to rebuild today and work today, and we will continue to come back. We will never forget the heartache and we'll always be here to bring them hope, so that someday, one day, the trumpets will sound in Musicians' Village, where we are today, play loud across Lake Ponchartrain, so that working people can come marching in and those steps once again can lead to a family living out the dream in America. We sat with poultry workers in Mississippi, janitors in Florida, nurses in California. We listened as child after child told us about their worry about whether we would preserve the planet. We listened to worker after worker say "the economy is tearing my family apart." We walked the streets of Cleveland, where house after house was in foreclosure. And we said, "We're better than this. And economic justice in America is our cause." And we spent a day, a summer day, in Wise, Virginia, with a man named James Lowe, who told us the story of having been born with a cleft palate. He had no health care coverage. His family couldn't afford to fix it. And finally some good Samaritan came along and paid for his cleft palate to be fixed, which allowed him to speak for the first time. But they did it when he was 50 years old. His amazing story, though, gave this campaign voice: universal health care for every man, woman and child in America. That is our cause. And we do this -- we do this for each other in America. We don't turn away from a neighbor in their time of need. Because every one of us knows that what -- but for the grace of God, there goes us. The American people have never stopped doing this, even when their government walked away, and walked away it has from hardworking people, and, yes, from the poor, those who live in poverty in this country. For decades, we stopped focusing on those struggles. They didn't register in political polls, they didn't get us votes and so we stopped talking about it. I don't know how it started. I don't know when our party began to turn away from the cause of working people, from the fathers who were working three jobs literally just to pay the rent, mothers sending their kids to bed wrapped up in their clothes and in coats because they couldn't afford to pay for heat. We know that our brothers and sisters have been bullied into believing that they can't organize and can't put a union in the workplace. Well, in this campaign, we didn't turn our heads. We looked them square in the eye and we said, "We see you, we hear you, and we are with you. And we will never forget you." And I have a feeling that if the leaders of our great Democratic Party continue to hear the voices of working people, a proud progressive will occupy the White House. Now, I've spoken to both Senator Clinton and Senator Obama. They have both pledged to me and more importantly through me to America, that they will make ending poverty central to their campaign for the presidency. And more importantly, they have pledged to me that as President of the United States they will make ending poverty and economic inequality central to their Presidency. This is the cause of my life and I now have their commitment to engage in this cause. And I want to say to everyone here, on the way here today, we passed under a bridge that carried the interstate where 100 to 200 homeless Americans sleep every night. And we stopped, we got out, we went in and spoke to them. There was a minister there who comes every morning and feeds the homeless out of her own pocket. She said she has no money left in her bank account, she struggles to be able to do it, but she knows it's the moral, just and right thing to do. And I spoke to some of the people who were there and as I was leaving, one woman said to me, "You won't forget us, will you? Promise me you won't forget us." Well, I say to her and I say to all of those who are struggling in this country, we will never forget you. We will fight for you. We will stand up for you. But I want to say this -- I want to say this because it's important. With all of the injustice that we've seen, I can say this, America's hour of transformation is upon us. It may be hard to believe when we have bullets flying in Baghdad and it may be hard to believe when it costs $58 to fill your car up with gas. It may be hard to believe when your school doesn't have the right books for your kids. It's hard to speak out for change when you feel like your voice is not being heard. But I do hear it. We hear it. This Democratic Party hears you. We hear you, once again. And we will lift you up with our dream of what's possible. One America, one America that works for everybody. One America where struggling towns and factories come back to life because we finally transformed our economy by ending our dependence on oil. One America where the men who work the late shift and the women who get up at dawn to drive a two-hour commute and the young person who closes the store to save for college. They will be honored for that work. One America where no child will go to bed hungry because we will finally end the moral shame of 37 million people living in poverty. One America where every single man, woman and child in this country has health care. One America with one public school system that works for all of our children. One America that finally brings this war in Iraq to an end. And brings our service members home with the hero's welcome that they have earned and that they deserve. Today, I am suspending my campaign for the Democratic nomination for the Presidency. But I want to say this to everyone: with Elizabeth, with my family, with my friends, with all of you and all of your support, this son of a millworker's gonna be just fine. Our job now is to make certain that America will be fine. And I want to thank everyone who has worked so hard – all those who have volunteered, my dedicated campaign staff who have worked absolutely tirelessly in this campaign. And I want to say a personal word to those I've seen literally in the last few days – those I saw in Oklahoma yesterday, in Missouri, last night in Minnesota – who came to me and said don't forget us. Speak for us. We need your voice. I want you to know that you almost changed my mind, because I hear your voice, I feel you, and your cause it our cause. Your country needs you – every single one of you. All of you who have been involved in this campaign and this movement for change and this cause, we need you. It is in our hour of need that your country needs you. Don't turn away, because we have not just a city of New Orleans to rebuild. We have an American house to rebuild. This work goes on. It goes on right here in Musicians' Village. There are homes to build here, and in neighborhoods all along the Gulf. The work goes on for the students in crumbling schools just yearning for a chance to get ahead. It goes on for day care workers, for steel workers risking their lives in cities all across this country. And the work goes on for two hundred thousand men and women who wore the uniform of the United States of America, proud veterans, who go to sleep every night under bridges, or in shelters, or on grates, just as the people we saw on the way here today. Their cause is our cause. Their struggle is our struggle. Their dreams are our dreams. Do not turn away from these great struggles before us. Do not give up on the causes that we have fought for. Do not walk away from what's possible, because it's time for all of us, all of us together, to make the two Americas one. Thank you. God bless you, and let's go to work. Thank you all very much. “The president tonight renewed his call for an economic recovery plan. But the plan he and Congress have offered leaves out tens of millions of Americans who need help the most. This plan would take months to have any impact, and the people I meet everyday on the campaign trail do not have months to wait. These people are hurting now and need this help now. Over the past seven years, typical workers’ paychecks have failed to keep up with inflation, millions of families are facing the loss of their homes to foreclosures, health insurance premiums have doubled, and families are spending $1,000 more a year on gasoline. The State of the Union may be interesting political theater, but until we find bold solutions to the challenges facing the country, we will be stuck with the same old small, Washington answers. The campaign will launch aggressive media buys starting in 10 states and likely expanding in the days leading up to February 5th. These will be significant media buys that will have a real impact on the race, particularly because voters in these states have not yet had broad exposure to John Edwards’ message. 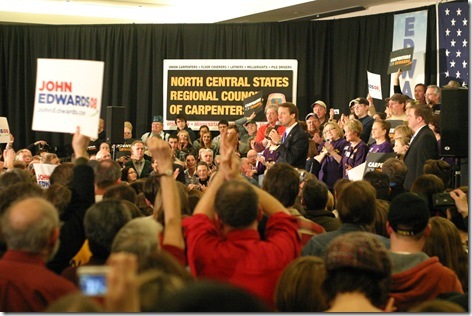 As we saw in South Carolina, once people have a chance to hear directly from John Edwards, the numbers move. Minnesota: Edwards has the support of dozens of Democratic elected officials and party leaders from every region of the state including U.S. Representative Jim Oberstar, Chairman of the U.S. House Transportation and Infrastructure Committee, State House Majority Leader Tony Sertich and Former MN State Senator Ted Mondale. 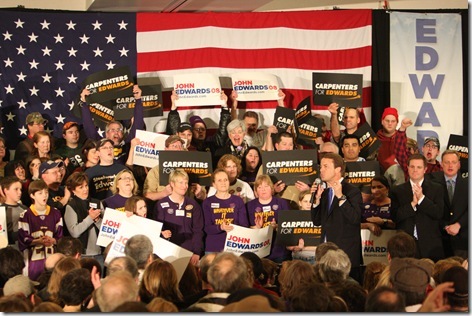 On Tuesday, January 29th, 2008, Senator John Edwards will travel to St. Paul, Minnesota to meet with voters and discuss his plans to make sure our government works for working families and the middle class, not just special interests. From guaranteeing universal health care to creating good jobs and enacting trade deals that help workers, not just big multinational corporations, Edwards will take on entrenched interests and fight for working and middle class families. "Powerful entrenched interests are standing in the way of the change our country desperately needs," said Edwards. "We need to stand up for the middle class and American jobs before it's too late. Saving the middle class is going to be an epic battle, and that's a fight I was born for. I know that if we stand together, we can take back our country. We can build the One America we all believe in." The details of this event are included below. The event is free and open to the public. For more information or to RSVP please visit the John Edwards for President web site at: www.johnedwards.com/stpaul. Chapel Hill, North Carolina – Today, the John Edwards for President campaign announced the grand prize winner of the “My Vote, My Voice” ad contest, an entry entitled “Dear Rural America” created by brothers Neil and Drew Schimmenti of San Jose, California. On Tuesday, the Schimmenti brothers flew to New York City to meet with Sen. Edwards and to develop their concept into a 30-second television spot. The campaign will air the Schimmenti’s ad in Oklahoma prior to the February 5th Super Tuesday primary. “There is a big difference between being politically aware and politically active,” said Drew Schimmenti. “We made this video because we care about our country and want to influence its direction.” Originally from Nantucket, Massachusetts, the Schimmenti brothers currently live in San Jose, California, where they are passionate about progressive politics, creating social change and both contribute to lateforlife.com. Edwards’ commitment to helping rural America has been central to his campaign. Born and raised in rural mill towns in South Carolina, North Carolina and Georgia, Sen. Edwards’ proposed “Rural Recovery Act” is a bold and comprehensive economic recovery plan for rural America, the details of which can be found on the campaign’s website at http://www.johnedwards.com/issues/rural/. Yesterday, in his hometown of Seneca, South Carolina, Edwards concluded a two-day “Back Home, Back Roads Barnstorm” of the Palmetto State’s small, rural towns, joined by special guests including Grammy-award winning musician Dr. Ralph Stanley, actor and activist Danny Glover and former Georgia Congressman and “Dukes of Hazzard” star Ben “Cooter” Jones. 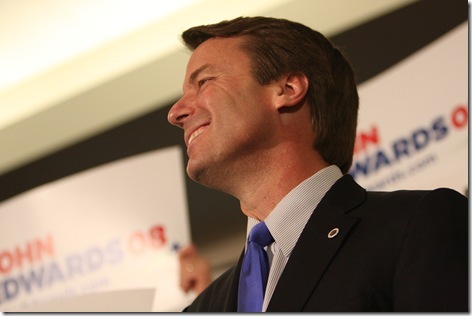 The Edwards campaign launched the “My Vote, My Voice” contest on December 28th, 2007, offering everyday Americans the chance to have their voice heard by creating an original ad describing why they support John Edwards. In the weeks that followed, the campaign was flooded with entries from across the country. The Schimmenti brothers’ grand prize winning entry was chosen by a panel of judges including: Elizabeth Edwards, Edwards national campaign manager Congressman David Bonior, Elizabeth Edwards’ brother and NYU Tisch Film School professor Jay Anania, actor and activist James Denton, bloggers Jane Hamsher and Christy Hardin Smith of FireDogLake, Wisconsin Democratic Party Chair Joe Wineke, and Congresswoman Eddie Bernice Johnson. Chapel Hill, North Carolina – As a sign of John Edwards’ growing grassroots support across the country, today the Edwards campaign announced that it has raised more than $3 million online during the first 25 days of the quarter – more than it raised during the whole 4th quarter of last year. Just yesterday, the campaign had one of its best fundraising days, taking in more than $230,000 in contributions. The vast majority of online contributions will be doubled by federal matching funds. The Edwards campaign has been built on reaching out to all Americans – not just those who can give the maximum donation to the campaign. Edwards is the only candidate who has never taken a dime from Washington lobbyists or PACs. He continues to gain new support as he travels the country to talk with voters about his plans to fight for the middle class. - Edwards enjoys strong grassroots support with 93 percent of online contributions coming in amounts of $100 or less. - Fifty-two percent of those making contributions online this quarter are new contributors. Americans are also responding to Edwards’ Tuesday night debate performance, where he remained focused on the issues that really matter to voters. During the hour following Tuesday night’s debate, the campaign saw a significant spike in online fundraising – setting the pace for days of donations arriving in record amounts. Building on the momentum from Tuesday’s debate, today the campaign released new two ads in South Carolina that highlight Edwards’ commitment to talking about the challenges facing America, instead of attacking his opponents. 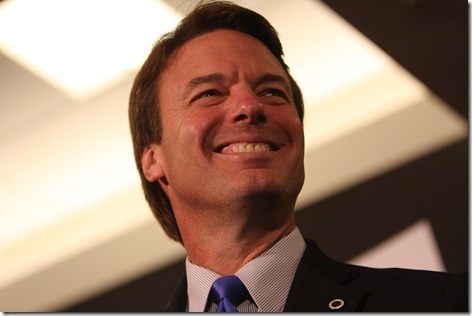 Columbia, South Carolina – As Senators Clinton and Obama continue to squabble, the John Edwards for President campaign today released two new ads in South Carolina focusing on the issues that really matter to the American people in this election. Today, on the last day before the primary, Edwards is campaigning across South Carolina to meet with voters and tell them, as president, he will never forget the voices of South Carolina’s working families. Joined by James Lowe, his parents Bobbie and Wallace Edwards, his daughter, Cate, and Rev. James Blassingame of Sumter, South Carolina, Edwards is discussing his bold plans to make sure America’s working families have a voice in Washington. SENATOR OBAMA: While I was working on those streets, you were a corporate lawyer sitting on the board of Wal-Mart. SENATOR CLINTON: I was fighting against those ideas when you were practicing law and representing your contributor, Rezko, in his slum landlord business in inner-city Chicago. EDWARDS: This kind of squabbling - how many children is this gonna get health care? How many people are gonna get an education from this? This is not about us personally. It is about what we are trying to do for this country. I'm John Edwards and I approve this message. ANNOUNCER: The middle class is being squeezed. An economic crisis looms. Our nation is at war. And too many Americans have no health care. And what do we get from two Washington politicians running for President? Nasty squabbling and personal attacks. It's time we had a grown up in the White House who understands us and will actually get something done for the middle class. EDWARDS: I'm John Edwards and I approved this message because I'm proud to represent the grown up wing of the Democratic Party. While Senator Clinton and Senator Obama seem intent on tearing each other down, I'm intent on building you up. This campaign isn't about us personally. It's about what we're trying to do for this country. I understand the struggles middle class families face, just like mine did right here in South Carolina. And, as your President, I'll fight everyday to strengthen the middle class, create good paying jobs, stop unfair trade deals, and make our government work for the American people, not for a bunch of irresponsible corporations. It's time we had a President who will stand up for the American people. ANNOUNCER: Paid for by John Edwards for President. 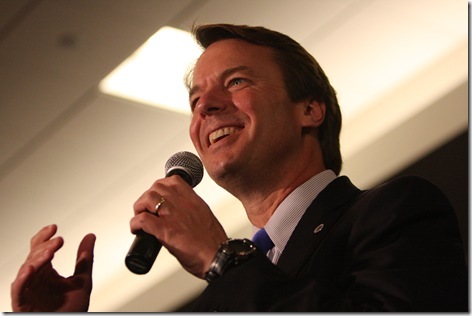 Columbia, South Carolina – Two days before South Carolina voters go to the polls, the John Edwards for President campaign unveiled a new theatrical trailer for Native Son: The Movie starring Senator John Edwards. The trailer, narrated by well-known voiceover artist and Edwards’ supporter George DelHoyo, highlights how Edwards has spent his life standing up to the rich and powerful to help the kind of regular people he grew up with in the Palmetto State, and how, as president, Edwards will rescue a nation hijacked by special interests and deliver it back to the hands of the people. Today, Edwards wraps up a two-day “Back Roads, Back Home Barnstorm” of South Carolina’s small towns and rural communities to bring attention to the millions of rural Americans who, for too long, have been forgotten by Washington politicians. Edwards has seen how the voices of working Americans – like James Lowe, who could not speak for 50 years because he did not have health insurance, like the men and women who worked in the mills with his father Wallace, and like so many others he has met across South Carolina, have been forgotten. Joined by James Lowe, his parents Bobbie and Wallace Edwards, his daughter, Cate, and Rev. James Blassingame of Sumter, South Carolina, on the last day before the primary, tomorrow Edwards will campaign across South Carolina to meet with voters and tell them, as President, he will never forget the voices of South Carolina’s working families. NARRATOR: In a world where candidates are many, one man stands apart from the crowd. EDWARDS: When people say to me, ‘why are you running for President of the United States,’ I can say it in one sentence. I’m running for President of the United States because I want everyone in America to have the same chances that I’ve had. NARRATOR: Born to humble beginnings in South Carolina, he spent his life fighting against the rich and powerful to help the kind regular people he grew up with. SUPPORTER: Give ‘em hell, Johnny. NARRATOR: Now we have the chance to let him bring that fight to the White House, to rescue a nation hijacked by special interests and deliver it back to the hands of the people. EDWARDS: The strength of America’s not just in the Oval Office, the strength of America is in this room, right now. It’s the American people, the incredible capacity of the American people to do great things. And we need you. Your country needs you. NARRATOR: From the people that want to end this senseless war, comes the story of the man who will bring you stronger schools, smart trade and universal health care. Starring South Carolina’s native son, John Edwards. 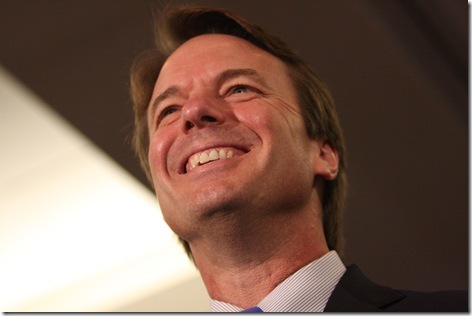 On January 26th, choose a brighter future – John Edwards for President. EDWARDS: I’m John Edwards, and I approve this message.